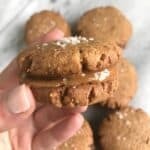 The Best Damn Grain Free Peanut Butter Cookie Sandwiches are made gluten-free, come together in less than 30 minutes, and are made with no refined sugar! Yep, you heard it here first. 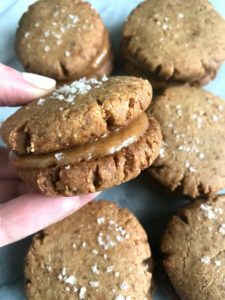 These are the best damn grain free peanut butter cookie sandwiches ever. I know you think I’m crazy for making that bold statement, but its true. And I’ve got a crew of people here in Philadelphia who were lucky enough to sample them and I’m positive they would all agree. And some of you might say, well your friends would say that anyway, but I like to think I have a very honest group of friends. So I’m going to keep the bold statement and claim that they are the best cookie sandwiches ever. They are seriously easy to make, are grain and gluten free, are made with natural sweetener. Who knew that eating a cookie sandwich could actually be healthy? In a bowl, mix peanut butter, coconut oil, and coconut sugar. One cup at a time, add in almond flour. Then add in salt. Scoop about 1.5 Tbsp dough onto baking sheet and flatten, these won’t rise. Bake for 13-15 minutes and let cool completely. While cookies are baking, mix filling ingredients together. Spoon about 1 Tbsp of filling on cookie and sandwich with another cookie. You could try a flax egg!! I haven’t tried it here. These were a hit for my family. 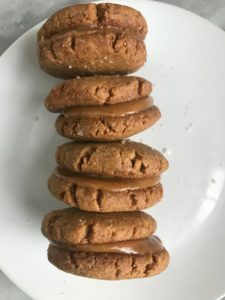 So flavorful, some of the best peanut butter cookies I’ve ever had! These are one of my favorites to make for friends! 🙂 SO happy you like!